Last month we finally took the long-awaited step of binning all our Shunts – at last their day is done. We’re shedding no tears. A big factor in this decision was the arrival of a delivery of the Safetec Duck R – aka ‘the stainless-steel Brazilian half-a-shunt’. 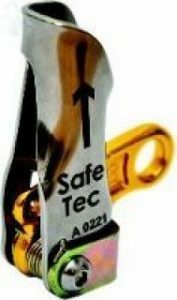 Safetec looked at the back-up problem a few years ago, decided they didn’t like the alternatives, so made their own version of the device they liked best. The first version of the Duck was almost an exact copy of the Shunt – just for one rope. 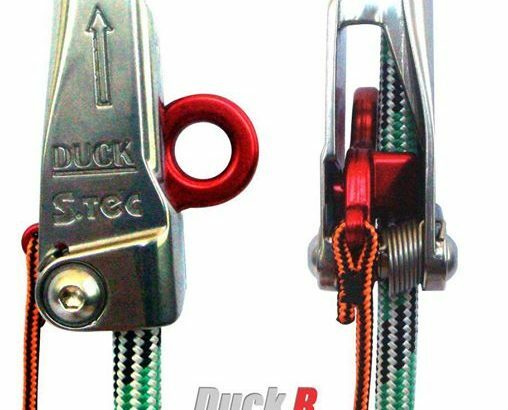 But the new version – the Duck R (‘R’ for rescue) – has been re-engineered to solve many of the Shunt’s problems whilst offering a familiar user experience. Crucially it has also passed the European back-up device standard – EN 12841 A – and comes with a full set of instructions for rope access use. The Duck Mk 1 – half a shunt! Made of stainless steel, the device can be used on a cow’s tail and is much stronger than the original device (a major failing of the Shunt was its weak body which, if prevented from sliding, would simply pop off the rope at loads as low as 4kN). The cam face and geometry has also been redesigned so the device slips at higher loads (though still well below the EN standard 6kN limit), meaning less slippage in a fall, reduced clearance distances and making it much more suitable for two-person rescue loads. Unlike the Shunt, the Duck R comes factory fitted with a sewn cord for towing. At 4mm thick and 40mm long this has been designed to be just big enough to get a decent grip for towing whilst maximising the chance of release in an emergency. S’tec do not recommend that the device is routinely continuously towed in descent, but allow that it may need to be for short distances – such as hopping out to clear an overhang or window. In common with other manually-positioned devices it has the problem that the device will not engage if the towing cord is not released, or the device, or rope above the device, is grabbed. These remain significant issues but, with the correct training and supervision, IRATA’s safety record suggests they can be overcome. On the other hand the Duck will require significantly less cross-over training than, say, an ASAP. In terms of reviewing the device there isn’t much to say – in normal use it performs like a Shunt, and anyone familiar with the Shunt will feel at home right away. The cord is a little shorter than most will be used to, but seems a fair compromise given the need to release. Without running a series of drop tests its hard to say much more. What would be great is if IRATA, or a similar body, conduct a thorough range of independent tests so we have a better idea of how all the devices perform in different situations. So is this the device to replace all back-ups? I don’t think so – but it is a very usable choice. Happily we are now (finally!) at a point where we have a range of good, purpose-built, type-approved devices from which to choose. 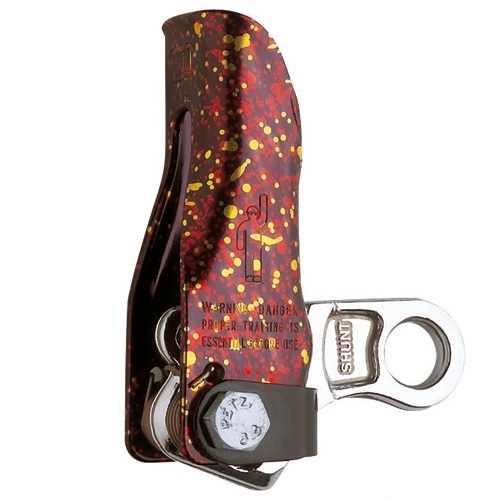 With the forthcoming release of the DMM Catch this summer (we have a prototype available for techs to evaluate), and the recent rumours of Petzl’s new device (supposedly a smaller ASAP with a positioning catch) the choice will be even better. I doubt we will ever see a device that beats all others in all situations, but what we do have is a selection of solid-performing devices that we can choose to suit the situation. At present, my choice of device depends on the users and the type of job. Accident statistics concerning back-ups are still fairly thin on the ground and it can be hard to decide whether protection against working line failure is more important than protection against losing control of a descender, or whether clearance distance is a bigger issue than impact force. For inexperienced users, and jobs that require constant movement, a fall-arrest device like the ASAP will probably be the best choice. For more experienced tech, performing tasks where much of the work is spent stationary on the ropes, or close to structure with which they could collide in a fall, a device like the Duck that can be placed high and out of the way may be a better choice. During training we have a range of devices available – the ASAP and Duck being the most used at present – and explain when and where which is more appropriate. If you want to check one out feel free to drop in if you are passing – the coffee machine is always on!